White paper on crime 2001 Part3/Chap.2/Sec.4/1. Juvenile training schools admit persons who have received family court adjudication for commitment to a juvenile training school as a protective measure. As of April 1, 2001, 52 juvenile training schools as well as one branch school had been established nationwide. In principle, offenders may be legally detained in a juvenile training school until they reach the age of 20. When the periods between the adjudication for commitment to a juvenile school and the 20th birthday of the juvenile in question is less than one year, the superintendent of the juvenile training school may detain the juvenile for one year counting from the date of the commitment. Medical schools (for juveniles aged 14 or over but under 26 with a serious physical or mental disorder). Males and females are detained separately, except in medical schools. The type of school in which a juvenile is to be detained is decided in family court adjudication. In deciding on commitment to a primary or middle juvenile training school, however, a family court may make a recommendation concerning treatment that short-term treatment (general short-term treatment or special short-term treatment)is appropriate for the juvenile in question. Thus, some juvenile training schools specifically provide short-term treatment, while others specialize in long-term treatment. Short-term treatment is provided for juveniles whose correction and rehabilitation can be expected through continuous and intensive guidance and training for a short period, despite a certain level of tendency toward delinquency. This is because early improvement is deemed likely in light of the simplicity or relative lightness of the offender's problems. Accordingly, this type of treatment is provided in an open atmosphere. For operational purposes, short-term treatment is classified into general short-term treatment, continuing for six months at most, and special short-term treatment is provided for those who are less inclined to delinquency and continuing for four months at most. Long-term treatment is provided for those who are not suitable for short-term treatment. 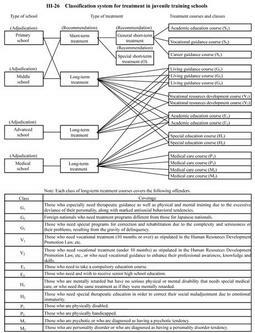 This classification system for treatment in juvenile training schools is shown in Fig. III-26 . Following the adjudication for commitment of a juvenile to a juvenile training school, the juvenile classification home in charge designates a juvenile training school to which the juvenile is to be admitted, considering the characteristics of the juvenile and the necessity of education in light of the contents of treatment courses conducted in each training school. Superintendents of juvenile training schools should issue an early discharge request to the relevant Regional Parole Board when they consider that the goal of correction has been attained for a juvenile. Superintendents should issue requests for release on parole to the Board when they consider such measures to be appropriate due to the fact that a juvenile has improved to the highest level of treatment. In addition, the Amended Juvenile Law provides that correctional education can be given to juveniles under 16 who were sentenced to imprisonment with or without labor by accommodating such juveniles in a juvenile training school, until they reach 16 years of age, as one aspect of execution of sentence. Such juveniles are designated as"convicts accommodated at a juvenile training school, "and treatment based on the regulations of the Juvenile Law are implemented for such juveniles while they must share living quarters and classrooms, etc. separately from the juveniles who are admitted with protective measures, except for the application of the Prison Law regarding escape, discharge, etc. Additionally, when juveniles reach 16 years of age, and are transferred to a penal institution, a smooth transfer of treatments should be considered through continuation of individual treatment plans.